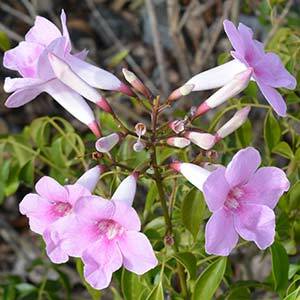 Brilliant pink flowers and mid green foliage make Pandorea jasminoides ‘Southern Belle’ an excellent choice for a range of landscaping situations. Although this is a fairly vigorous plant, it is more compact than other varieties and can be used either as a shrub, or as a climber. It is free flowering and puts on a great show from early summer well into autumn. The flowers are the typical tubular type, pink petals with a deeper pink to crimson throat. The specimen pictured is grown as a shrub, a little regular pruning keeps it in shape. Flowers are followed by large elongated seed pods. Landscaping Uses. Use as a climber to cover a wall or fence. When pruned and shaped, use Pandorea jasminoides ‘Southern Belle’ as a small shrub. Planted in a container, Pandorea jasminoides ‘Southern Belle’ can be grown on a balcony, deck or outdoor living area and attained to grow over a pergola or similar. Best in a humus rich well drained soil with some afternoon shade. Mulch around plants to maintain some moisture and control weeds as the plant establishes itself. If growing as a climber, provide a strong support rather than letting the plant scramble over other plants. Best pruned lightly after flowering, this can be carried out after each flush of flowers. Structural pruning by removing some laterals will provide a more open look in a shrub. Height – Will reach 3 – 4 metres in height, however easily pruned to 1m or less. Spread – Will form a clump up to 3 metres over time. Flower Colour – Pink with a deeper pink throat. Flowering period – Spring or Early summer through to Autumn. Drought tolerant – Yes once established, however extra water during long dry summers will promote good growth.